Welcome. I am Lesli Dalaba, M.Ac. M.S. 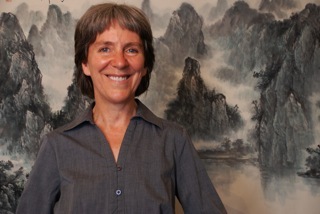 E.A.M.P., a licensed acupuncturist and East Asian Medicine Practitioner in Wallingford, Seattle. I have been practicing acupuncture in Seattle since 1993. I came to acupuncture with a background in music and chemistry. I received a Master’s Degree in Acupuncture and a Chinese Herbal Medicine certificate from the Northwest Institute of Acupuncture and Oriental Medicine (NIAOM) in Seattle. I furthered my education with a three-month post-graduate internship at the Zhejiang Institute of Traditional Chinese Medicine. My continuing education courses have focused on Japanese acupuncture and whole food nutrition. After returning from China, Christopher Huson and I opened Neighborhood Acupuncture on Capitol Hill in Seattle (1993-2009). I also worked for King Country Drug Court, and for Kang Wen Clinic, providing acupuncture and herbal medicine for people with HIV. For seven years I was a faculty member at NIAOM, up until the school’s closing in 2002. I also served on the Board of the Acupuncture Association of Washington. I help patients suffering with many health issues including acute and chronic pain, anxiety, stress, fatigue, inflammation, recovery from injury or surgery, liver disease, digestive issues, depression, immune system weakness, allergies, insomnia, fibromyalgia, migraine, arthritis, heart conditions, chronic infections such as Lyme disease, and maintaining physical vitality and mental clarity throughout the day. I am a problem-solver who loves to take on difficult cases. Many people who come to me tell me they’ve tried everything. I enjoy untangling layers of symptoms like a detective. Combining the intellectual rigor and precision of a scientist with the creativity and intuition of a musician, I apply multiple approaches – pragmatic and intuitive – to help solve complex and persistent health problems. And whether the root is structural, metabolic, psychological, infectious or a combination, with your help, I promise we can put you back on the path to your natural good health. I spend a full hour with each patient and often send my patients home with self-care techniques to help you reach your health goals more quickly. I can also teach you how to take control of your own health and help motivate you to make positive changes at a comfortable pace. Ideally, our work together will be a true partnership: the more actively you take part in your own healing, the faster you will progress. I am also an accomplished musician who has played and recorded with many notable musicians such as Fred Frith, Jeff Greinke and Elliott Sharp. I was the founder of The Yellow Hat Band, a community brass band in Seattle, and was active in establishing HONK Fest West in Seattle.